When Ursula Kroeber Le Guin died on Jan. 22 at age 88 we lost a groundbreaking titan of science fiction. Le Guin placed women front and center in the genre for the first time. Her other favourite themes included ethnography, gender, religion, sexuality and the environment. She submitted her first story to a magazine at age 11(!) and spent years being rejected. Eighty-eight is not old enough. Here’s a bibliography. This short story kickstarted the Earthsea series: six books and eight short stories about a fantastic archipelago with magic, dragons, mauraders and diverse cultures and societies. Publication spanned 1968 to 2001 with a couple of racist adaptations (characters of colour played by white actors) along the way. Earthsea’s exploration of Jungian ideas make it a better, richer work than a certain other series about a precocious boy wizard. This won BOTH the 1970 Hugo and the Nebula Awards. Genly Ai of Terra is sent to the planet Gethen to get them to join a loose confederation of planets. Gethens are ambisexual and Ai’s interactions become complicated. Considered among the first feminist works of science fiction, this is also the genre’s most famous exploration of gender and androgyny. A character’s dreams alter reality. Serialized in Amazing Stories and nominated for both the Hugo and the Nebula awards (again!). PBS adapted it in 1980 as part of New York City’s WNET’s experimental television lab. Ursula considered this the best adaptation of one of her works. Like The Left Hand of Darkness, The Word for World is Forest belongs to Le Guin’s Hainish Cycle — an alternate history in which earth people/planets of nearby stars set up a loose federation. A military logging colony on the forest planet Athshe enslaves the peaceful locals, who eventually rise up. Hmm. Sort of like the plot of a certain 2009 James Cameron movie. Also part of the Hainish Cycle. Two planets with antithetical ideological systems orbit one another at a time of a revolutionary advance in communication. Le Guin based the main character on family friend Robert Oppenheimer! Another one in the Hainish cycle. 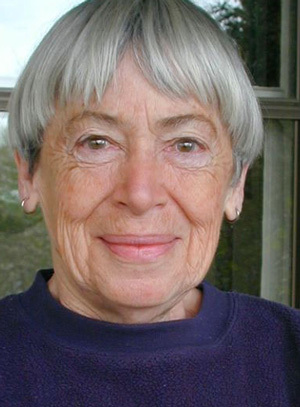 Le Guin explores her favorite themes: political and religious conflicts between corporations and indigenous people (she was the daughter of an anthropologist, BTW). It’s inspired by China’s Great Leap Forward and Cultural Revolution, with Taoist aspects and analogues to the suppression of religious practices.